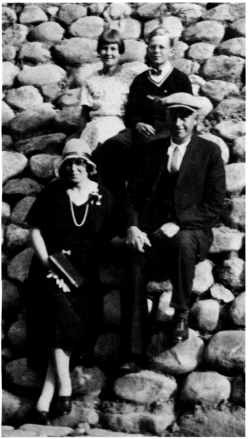 Gust and Olga Freko with children Beatrice and Gordon. developed into consignment merchandise in the form of tanned and beaded buckskin jackets displayed in his shop. Gus was often conscripted to provide a "taxi­ service" for his Indian friends, as well as a very informal loan service. He painstakingly kept a record of loan entries, but the slate was never wiped entirely clean! Gus dabbled in fur buying until about 1960, spinning many a yarn about the 'Old-Country' to spell-bound grandchildren. In a shop bedecked with old family portraits, hanging fur stretchers, a pot-bellied stove, and the aroma of leather and smoke, he wove his own gentle and soft-spoken kind of family historical tapestry. at the age of 34 years. Gordon married Elizabeth Margaret McLaren Taylor of Minnedosa in 1943, and shortly thereafter journeyed up the Alaska Highway to work as a mechanic for Walter Aikenhead of Neepawa. They lived and worked in Dawson Creek and Whitehorse, and later for the American Army. Between 1945-51, Gordon and Beth ran a Service Station at Clear Lake during the tourist season. In the off-season, Gordon ran a service shop in John O. Carlson's Case Machinery Shop for two years, then in the first location of Gordon's Service adjacent to the Quality Store. They also ran a Taxi Service in both Clear Lake and Erickson. Gordon's Service burned down in May, 1948 and was rebuilt in the fall of that year in its present location. The new building's Grand Opening was a charity dance on December 3, with proceeds donated to the Volunteer Fire Department. This was a tribute to the firemen and townspeople who participated in a bucket brigade to try to save the business building, and also the newly-built bank building (the latter of which survived). Beth's father, Bob Taylor and Pete Oleniuk manned the door, and everyone got more than they had bargained for. The newly laid concrete floor had been dyed maroon, and supposedly had plenty of time to cure. While enjoying dances to the music of Glen Frain and his Buckaroos, everyone ended up with maroon shoes! Arlene Elizabeth, Gordon and Beth's first born, on July 1, 1945, later married Terry S. Kubin in 1969, and in due course Travis Cord (1971) and Cobi Tara (1973) was born. Arlene attended Brandon College, then Teachers College in Winnipeg, where she taught elementary school for several years. She has shared her music talent through teaching privately for several years, and now is Director of the Yamaha Music School in Penticton, B.C. Pamela Gordene was born on Decemebr 13, 1947, married H. Garth Racher in 1972 and has two daughters, Lindsay Robin (1978) and Laine Megan (1981). After a B.H.Ec. degree from the Unversity of Manitoba, fashion merchandising interests led to Management Training at Eatons in Winnipeg, then to teaching of Fashion Mer­ chandising Technology at Olds College in Alberta. She completed a master's degree in Vocational and Career education, and is currently a workshop facilitator for the Alberta Career Center in Calgary. Gordon Mitchell Gustav was born on February 15, 1955, and married Maria Sbert in 1978 in the Canary Islands, Spain. With their son, Eric Taylor (1980), they reside in Calgary where Mitch is a constable with the City Police Force. In 1966, Gordon, Beth and their three children fulfilled Gus' liftime dream to return to his homeland. Visiting with remaining kin at Hakallestrand, they made the boat trip to Frekoya Island, and Sande Church parish where Gus spent his boyhood. The circle somehow became complete: Freko's returned to Frekoya. There is a wonderful mythical law of nature that the three things we crave most in life -- happiness, freedom and peace of mind - are always attained by giving them to someone else.